Note: This story may contain minor spoilers. 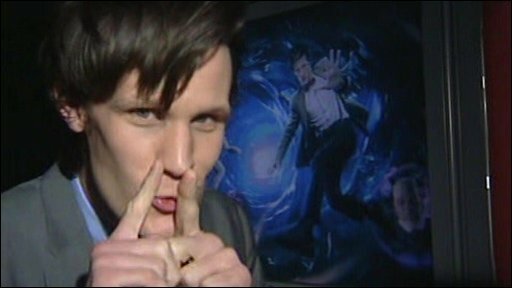 Matt Smith's debut in the new series of Doctor Who has had its world premiere, with Smith saying he is keen to stay in the role for a long time. In The Eleventh Hour, the newly-regenerated 11th Doctor crashes the Tardis on Earth, only to find himself battling a shape-shifting alien. The movie-style premiere in Cardiff was attended by Smith and Karen Gillan, who plays feisty new companion Amy Pond. The new 13-part series will be shown on BBC One, starting on 3 April. Smith, the youngest actor to play the Timelord, said at the premiere: "To my mind it's the best part in British television and I'm fortunate to have it and I'm going to keep it." His opening story, which has been described as "Independence Day on the village green", is a mix of comedy and scares. Smith, 27, told the BBC: "I'm pleased it's unleashed upon the world. I really hope people enjoy it and are thrilled with it." He said his most nervous moment had been the first day of filming on a Welsh beach last July. "I'd been waiting six months and thinking about it and suddenly you're on a beach and there's a Tardis there. It doesn't quite compute," he said. "But as time continues and you get better, it ceases to become nerve-wracking and it becomes a thrill and enjoyable - and that's exactly what it is now." Smith's TV debut was in the 2006 adaptation of Philip Pullman's The Ruby in the Smoke, which starred former Doctor Who companion Billie Piper as Sally Lockhart. Smith revealed he had received a "good luck" text message from Piper on Thursday shortly before the premiere. He also described his co-star Karen Gillan as the "sexiest companion that ever lived". Gillan spends most of the episode in a policewoman's uniform with a short skirt. She said: "What I love about Amy is that she has this feisty, independent, strong-minded exterior but underneath it all we know that she's actually this lost soul inside because of the way she meets the Doctor." Both Smith and Gillan said they had already had a positive reaction from fans. "We've had lots of lovely letters," the actress said. Smith added: "There's one fan who compares me to a hedgehog a lot, which is puzzling, but I've not had any bizarre requests. Everyone's been very kind and generous." As well as a new Doctor and companion, the episode also unveils a new-look Tardis interior. The new console looks like it has been constructed from items out of a junk shop, including an old typewriter, a telephone, pressure gauges and a Morse code machine. Smith has taken over the lead role from David Tennant, who played the time travelling hero for four years. The new series is also overseen by a new creative team, led by experienced TV writer Steven Moffat, as Russell T Davies has also stood down as the show's producer and chief writer. Moffat said Smith's Doctor was very different from his predecessor. "David was sort of neat and fastidious like a humming bird. Matt is gangling and shambling - he's like a terrible mess that somehow becomes elegant by magic, he said. "He brings back genuine madness to the role of the Doctor - Matt's Doctor is bonkers." Filming on the 2010 series is still under way - and due to end on Saturday. Doctor Who began in 1963, and seven actors played the Doctor before the show was dropped in 1989. After a TV movie in 1996 - starring Paul McGann - the TV series returned in 2005 with Christopher Eccleston in the lead role. Tennant took over in the same year.